A chance encounter of an American G.I. in France after World War II with a local fisherman led to the development of a major industry in Antigo, Wisconsin and put Antigo on the sports fishing map. Frank Velek discovered a fishing lure while stationed in France and had considerable success with it. Andre Meulnart had invented his spinning fishing lure in France and patented it in 1938. Velek, brought some back to Antigo and showed them to his friend Todd Sheldon, operator of a sporting goods shop. Sheldon put them in his tackle box and forgot them. Two years later, having poor luck fishing on the nearby Wolf River, in desperation he gave one a try. Within two hours, he had four trout weighing more than 12 pounds total. Layout for a Mepps ad. Image courtesy of Sheldons Inc.
Sheldon worked through Velek to obtain more lures to sell in his shop. Velek had an arrangement with a woman in France who sent him Mepps spinners in exchange for nylons. Soon customer demand for lures exceeded her need for nylons so he began buying lures directly from Meulnart’s factory. Sales were good and in 1956 Sheldon sold his store and formed Sheldons Inc. to focus on importing and manufacturing lures. Sheldon acquired exclusive rights to sell the Mepps spinner in the U.S. and 1973 he bought out the French company. Sheldons’, which had started in a ten-foot-square room in the back of a small sports shop in downtown Antigo, had become one of the most important manufacturers of fishing tackle. Sheldon passed away in 1995 at the age of 81 years. Today his son Mike and two grandsons, head the company. Sheldons’ Inc. now owns Mepps S.A. (Mepps France) and Mister Twister, a soft plastics lure company located in Louisiana. The Mepps Aglia, the original French spinner, is still manufactured in France. Lures sold in the U.S. are assembled, packaged, and distributed in Antigo. The Aglia still accounts for the bulk of Sheldons’ sales. Robert C. Willging, “The Mepps Story,” in History Afield: Stories from the Golden Age of Wisconsin Sporting Life (Madison: Wisconsin Historical Society Press, 2011), 21-24. Object story created October 2015. 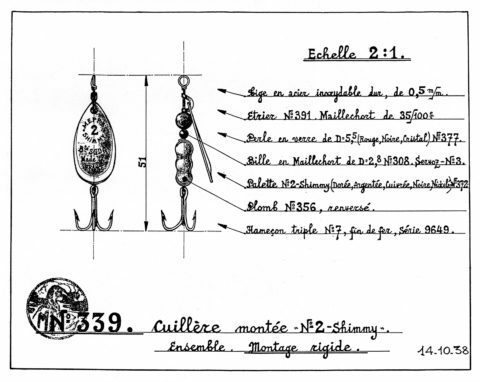 Featured image: Andre Meulart’s submission for a French patent on his lure in 1938. Image courtesy of Sheldons Inc.